"A woodcarver is one who can take a scrap of wood, breathe life into it with patient, skilled hands, and make it a warm object of lasting beauty. 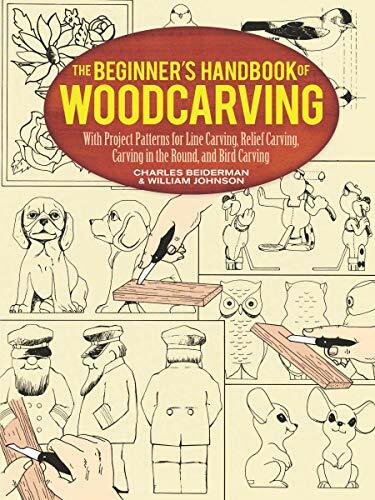 That is creativity," say award-winning craftsmen Beiderman and Johnston in this well-organized and highly instructive guidebook that tells you everything you need to know to create attractive woodcarvings. Especially written for the novice, it shows how to produce realistic animals, flowers, and humorous figures in a variety of forms: in the round, in relief, and as line carvings. A wide spectrum of more than 60 project patterns offers practical plans and ideas for carvers at all levels of expertise. The authors provide a detailed yet easy-to-follow introduction to carving tools and how to use them. There are also helpful hints to guide beginning carvers through difficult stages of carving, and expert advice on painting and finishing, woodcarving as gifts, how to exhibit and enter carvings in competition, and much more. You'll even find a whole chapter devoted to carving birds. Abundantly illustrated with over 200 photographs and detailed line drawings, this first paperback edition of The Beginner's Handbook of Woodcarving will be welcomed by any would-be woodcarver seeking a thorough, reliable, and crystal-clear introduction to the age-old art of carving wood.